TIGARD — Together, they gave opposing offenses fits as powerful forces for the Tigard High School football team's defense. Now, they're going to get a chance to do the exact same thing at the collegiate level. And they're pretty happy about it. 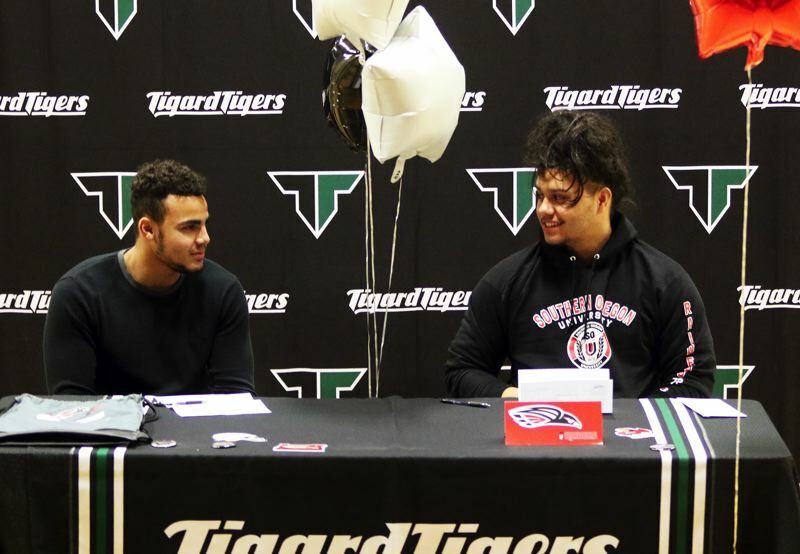 Noah Jackman and Isaia Tavita Porter, both Tiger seniors, signed their national letters of intent to play college football at Southern Oregon University in front of friends, family, teammates and coaches during a ceremony held at the school on Feb. 6. "It's just a big weight off my shoulders," Porter said after signing his letter of intent. "I've been waiting for this moment for a really long time, and making it official today is just a really great feeling. It's awesome." "It means a lot," Jackman said. "There was a lot of work on my family's part, on my teammates' part. They all helped me out." This past fall, Jackman and Porter helped Tigard to an overall record of 10-2, and a berth in the quarterfinal round of the Class 6A state playoffs. They both felt that the university located in Ashland was the best place to continue their scholastic football careers. "It's just the best fit," Jackman said of Southern Oregon. "It's somewhere where I could develop, play and get my degree." "They're a strong program, and they're looking to make a run at a national championship again," Porter said. "And, hopefully with me and Noah, and some of the other signees, we'll be able to get them there again." There's another reason why Porter is looking forward to playing at Southern Oregon. "My brother (former Tualatin High School standout James Porter) plays down there," he said. "This will be the first time we've ever played together. That's a big reason. As soon as I was there, I loved the environment, I loved the atmosphere, and everything about the coaching staff. They're just really honest there, and I fell in love with the place." The 6-foot, 255-pound Porter, in his senior season at Tigard, was shared both the Three Rivers League Offensive Lineman of the Year and Defensive Lineman of the Year honors. He was also a Class 6A all-state first-team pick on both sides of the ball. He said that Southern Oregon is most likely looking at him to play at defensive end. "Ever since junior year, when I knew I wanted to play college ball, I've been waiting for my opportunity," Porter said. "When I took my official visit to Southern, it felt like home. I'm glad I got it done, and now I can continue on to the next stage." Jackman (6-3, 230) was a first-team All-Three Rivers League pick at both defensive end and tight end. He was a first-team all-state selection on defense and an honorable-mention pick on offense. Jackman said that Southern Oregon is also looking for him to likely play at a defensive end spot. "It will take a lot of work," Jackman said of playing at the college level. "I need to keep grinding. Just keep working hard." And, for both Porter and Jackman, it should also help having a Tigard teammate there. "It's just really awesome to have another teammate there," Jackman said. "Me and Noah have worked for this moment ever since our freshman year. To be able to sign together today is just a good feeling." "It makes it more special," Jackman said. "It's a teammate, and we already have a strong connection. Going there together, I think we'll be able to do some work." Southern Oregon's 2019 recruiting class includes another local player, Sherwood senior lineman Jackson Barton.